Margaret Thatcher said: “Europe was created by history. America was created by philosophy.” There was a United States of Europe once. It was called Christendom. Sometime after Thomas Aquinas finished his Summa Europe’s focus began to change from the pursuit of things eternal to the pursuit of things temporal, to the enjoyment of the material riches created by centuries of Christian order. In time that change reached the core of Europe’s spirit. The German Reformation arrived and challenged the ancient vision of the Church, the nature of authority, the purpose of obedience. The fruits of the Reformation were soon made evident in the French Revolution, the Weimar Republic, Marxism, Communism… Europe’s slow death by ideas progresses even to this day. Just a few years before the French Revolutionaries killed the King of France, the American Revolution triumphed with some help from the French Catholic crown. Our revolution was a reluctant revolution against a Parliament that already had destroyed Ireland because of her obstinate catholicity. Ireland was a nation under God who refused to be a nation under a human king demanding godlike obedience. It was very present in the mind of our Founding Fathers that we could go the way of Ireland if we did not arrest the growing signs of oppression coming from Parliament. And so, in a subtle way, the American Revolution was a statement in favor of the universal brotherhood of man, a catholic revolution of sorts. It remains a unique milepost in the history of mankind. In our land we do not have a king who is head of a state church. God is in Heaven, we are under His rule, constitutionally so. That idea is at the core of the American Revolution. 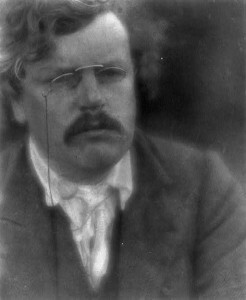 Chesterton intuition saw in the American flag a symbol of hope lost even to the Britain that should have inherited the catholic sentiments of Edward the Confessor and the crusader king Richard the Lionhearted but succumbed to the folly of Henry VIII. Only God knows how we are going to surmount the perils we face now. Europe may have been the Faith once but now the Faith lives here in this nation under God, this band of brothers who are not united by common ancestry or mere geography but by the conviction that God has endowed man with certain inalienable rights life, liberty and the pursuit of happiness. If the happiness that the American people pursue is spiritual happiness under God, then this happy realm will last for a long, long time. There are still some Catholics left in Europe, but unfortunately, I have to agree with Paul. Perhaps we will get a few missionaries from the US to Ireland to sort us out. In other times we gave missionaries to America. I do not know if I agree with you on all things, but many things you say are very thought-provoking. Your summary of European and Irish history may not be fully accurate. You also say the American Revolution was “a catholic revolution of sorts”. Again I wonder. The founding fathers might not be considered very pro-Catholic, with the exception of Charles Carroll. But as we focus this week on the role of Catholics in America, it’s worth remembering just how loathed Catholics were at the founding of this nation. Anyway, I wish y’all a great day on 4 July. I doubt that my summary of European history is wrong, mainly because I learned it from better heads than mine. The idea that the Reformation is at the root of all the Liberal movements that appeared in the last five centuries is not mine. I can assure you that. Of course if one reads some actual serious history… the case for that is presented over and over from many different angles and by many different authors. About the time of the Stamp Act Rebellion the case of Ireland was already a warning to Americans, most specifically the period after the enactment of the Penal Laws. It is amply quoted in revolutionary papers from the time of the Stamp Act all the way to the days of the Revolution. That may have been the reason many chose to fight instead of trusting the English crown to resolve the matters justly. The American Revolution also had an effect in the relationship between the Crown and Ireland: the Catholic Relief Act was passed in 1792 at a time when England could not afford to continue to suppress Catholics by force (guess why.) Many had taken the side of the Revolution along with Polish and French troops. The French and Polish soldiers whose help decided the contest in our favor were all Catholics. That alone made Catholics more likeable to many in America. It was not easy but it got much better rather quickly. Although some anti-catholic prejudices survive to this day. I don’t know where you get your information about such harsh treatment of Catholics in America. George Washington himself used to study from a book written by Jesuits who were around the northern parts of Virginia, and Ohio about a century before he was born. A Jesuit priest is reported to have been at Mount Vernon at the time of GW’s death. It was not easy for Catholics and there was persecution but this was not England by any means. Washington himself prohibited the celebration of Guy Fawkes Day and the burning of the Pope in effigy. Before 1792, several relief laws have been passed allowing Ireland to export cattle and other goods to England, for example. Unbelievable as it may seem to you the American Revolution cast a shadow on the politics of the British Empire. Notice that I used the “small c” catholic to say that the American Revolution was a “catholic revolution of sorts” because it went back to the concept of God above the realm of politics, a concept that was lost to Christendom after the German Reformation. The “nation under God” concept is a Catholic concept. George Washington’s Vision published 50 years before Fatima. I did say it is great to have you here. You liven things up, and your reply to me here is impressive. In your original post you wrote “Ireland was a nation under God who refused to be a nation under a human king demanding godlike obedience.” This is a debatable point, as it depends on the definition of “nation” and the rise of the “nation state”. But academic minutiae of this type are far from the thoughts of Prof Kenkor. So Carlos, again, many thanks for your lively, provocative and robust contributions. We could do with more.